Earlier this year, I began reading Robert M. Pirsig’s classic 1974 book Zen And The Art Of Motorcycle Maintenance (ZAMM) – but as of this writing, I’m still only halfway through and I haven’t picked it up for months. Why? Because I had a love-and-hate relation ship with ZAMM. Some of it is very beautiful in its simple elegance, but some of it is also dense and impenetrable (to me, anyway). Still, like my experience with Eckhart Tolle’s The Power Of Now, what I liked about ZAMM has stayed with me ever since. For one thing, I very much agree with what Pirsig had to say about quality, and how rational and romantic approaches to life can and should co-exist. For another thing, I enjoyed the moments when Pirsig described his journey and working on his motorcycle – they were very enchanting. 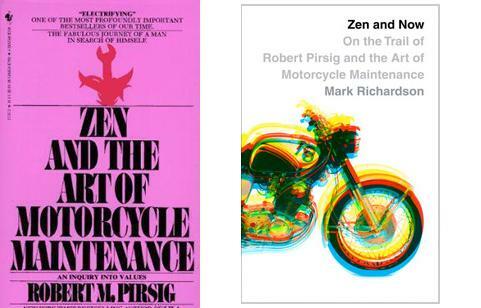 Recently, I was in my favourite local secondhand bookstore when I spotted a hardcover copy of a book I was previously unaware of – Mark Richardson’s Zen and Now: On the Trail of Robert Pirsig and the Art of Motorcycle Maintenance. A quick read of the inner-flap later, Zen and Now became a purchase. And during the next few days I became utterly absorbed by Zen and Now, in which Richardson wrote about several things together – his 2008 ‘Pirsig Pilgrim’ road trip that followed the original route; a look at Pirsig’s eventful, tumultuous and at times very sad life; and what Richardson got out of his trip and how it made him review his own life at the time. Altogether, that fascinating material and Richardson’s pleasant style made for one of my most fondly-remembered reads this year. I also got several valuable things out of Zen and Now. Firstly, Richardson’s account of Pirsig’s life has given me a great admiration and respect for the story behind and beyond ZAMM, and makes me want to go back to it – and when I do, perhaps those dense and impenetrable parts will be easier to understand. Secondly, Richardson’s own journey was very inspiring. On the rational side, it was a great undertaking that relied on both preparation and spontaneity, and it was very interesting to see how Richardson handled the varied aspects of his ride. On the romantic side, it gave Richardson time to think about and resolve some issues in his life, and his favourite moment of the trip gave him an especially powerful moment of reflection. Finally, Zen and Now brought back several memories of the brief period many years ago when I was a motorcyclist. As Richardson says at one point, an interest in motorcycles never leaves you, and although I haven’t ridden in almost 20 years I still have a fondness for bikes to this day. A moment in Zen and Now that was especially vivid was when Richardson described in great detail changing the oil on his bike – that took me right back to the first time I did the same for mine. If you’re either familiar, unfamiliar or (as I am) half-familiar with ZAMM, Zen and Now comes highly recommended as both a companion and a guide. As well, it’s a wonderful book in its own right about a man’s journey and what he discovers at its end. This entry was posted in Inspiration, Reading. Bookmark the permalink. I read most of “Zen,” but got stuck maybe three-quarters of the way through when it became really impenetrable. I like the idea though that working with your hands (like on a motorcycle) can have a calming effect. I also remember the couple he went motorcycling with, who had no patience with mechanical things. A dripping faucet drove them nuts. Also, when they tried to start their (hot) bike with the choke on they flooded it–but again they had no patience with trying to fix the problem, but instead just kept cranking away, belching gas fumes out their exhaust. All in all there were some valuable lessons in the book. Too bad I didn’t understand all of it though.